Sarah McNeil lives with her fisherman father and worrywart mother in Nova Scotia. From her bedroom window she can see Far Enough Island. This island becomes the refuge of her dog Jeremiah when the fishing boat he rides in catches fire and sinks. 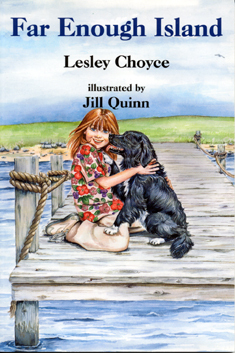 This chapter book was written by Leslie Choyce who lives in Lawrencetown Beach, Nova Scotia. Jill Quinn, the illustrator, lives in Dartmouth, N.S. Published by Pottersfield Press, East Lawrencetown, N.S.